A big theme in Gartner’s recent Multichannel Marketing Effectiveness Survey (client subscription required) is the emergence of mobile as a dominant channel for multichannel marketers. Now, for those who have been watching mobile’s share of ad revenues and digital time spent climb steadily upward, the notion of mobile’s dominance may seem old hat. It clearly enjoys that status for the audiences marketers are trying to reach. But marketers often have struggled to effectively incorporate mobile into their marketing strategies. We’ve seen that most multichannel marketers, for example, don’t see a need to go beyond creating mobile extensions of existing desktop-based engagement techniques (e.g., the website, advertising, search and email) — a finding consistent with the marketers who’ve used Gartner’s “Marketing Maturity Assessment” tool (client subscription again required) and rated mobile marketing their least mature capability. Marketer alignment with customer behavior — Because customers are spending more time on mobile devices and engaging in a greater variety of ways, marketers are recognizing that they must meet customers on their own terms. 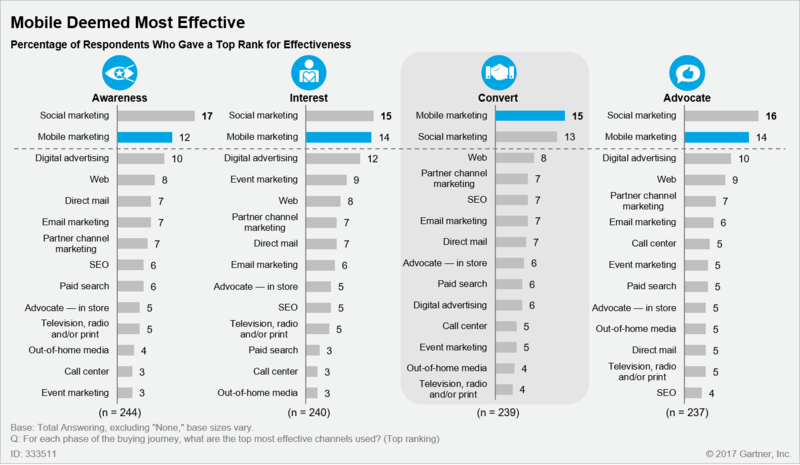 Beyond the growth in the number of mobile marketing techniques marketers are using, they now view mobile as one of the most effective channels at each stage of the buying journey. For the critical conversion portion of the customer journey, 15% of respondents say that mobile is the most effective channel. That’s an important finding to remember at this most mobile time of the year, when consumers rely heavily on their devices for both shopping and buying (witness mobile’s annual record-breaking performance during the Black Friday weekend and Cyber Week). Mobile advertising remains the top-ranked mobile technique across the buying journey, supported by a host of other tactics, notably mobile-optimized websites and mobile apps. For example, among respondents currently using, piloting, or with explicit budget for mobile-optimized websites and mobile apps, 71% say they agree or strongly agree that their mobile website and/or app plays a central role in converting interested audiences into paying customers. This belies the oft-cited chestnut that “mobile doesn’t convert” consistently from a digital commerce perspective.